Have you been searching high and low for the used car for sale that will suit your needs perfectly? Do you feel like you are coming up empty handed at car dealerships in Fort Wayne, Indiana? Then you haven’t been to Lucky 7 Car Store in Fort Wayne, Indiana to check out our used cars for sale in Fort Wayne. We are worth the drive from any nearby area because we have many makes, models, and body styles of used cars for sale. Our Lucky 7 Car Store website is user-friendly. You can quickly search our online inventory by make, model, price, or even body style. You can even fill out a secure online credit application and get a quote for your current vehicle that you are trading in on our easy to use website. Are you searching for Chrysler used cars for sale in Fort Wayne, Indiana? Then Lucky 7 Car Store in Fort Wayne has just the one for you. Like a used Chrysler 200 Limited car for sale. Used cars for sale like this used Chrysler 200 is not only stylish, but it is also economical. This used car for sale in Fort Wayne, Indiana has a high MPG at 23 miles per gallon in the city and an impressive 36 miles per gallon on the highway. This used car in Fort Wayne comes equipped with a 2.4-liter engine with an automatic transmission and front wheel drive. Key features such as an MP3 compatible radio, steering wheel controls, and wireless cell phone hookup for more accessible than ever hands-free calling and texting can be found on this used car for sale in Fort Wayne at Lucky 7 Car Store. Steering wheel controls are great because you can change the radio station, answer phone calls and turn the volume up or down without ever taking your hands off the wheel. Some safety features worth mentioning are the anti-lock brakes, electronic stability control, and braking assist. Other can’t miss features included with this used car in Fort Wayne are a tire pressure monitoring system and U-Connect infotainment system. This used car in Fort Wayne is ready to take on all of your driving needs here in Fort Wayne, Indiana. Whether that be going to and from work every day, running errands around town or taking the day off and heading out for a weekend getaway, so come and check it out today and take it out for a test drive. 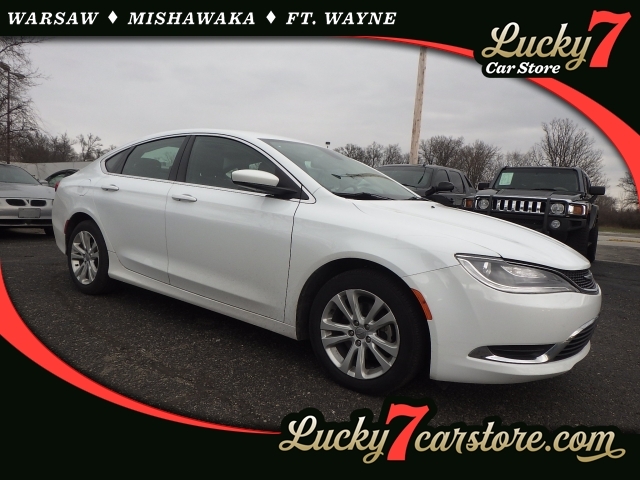 If this used Chrysler 200 car for sale is not the used car for you, we have many more used cars for sale in Fort Wayne, Indiana to choose from at Lucky 7 Car Store. Stop by to see what we have to offer you in our inventory of used cars for sale in Fort Wayne, Indiana today. Drivers all over Fort Wayne love our used cars for sale in Indiana. You can too when you come to Lucky 7 Car Store in Fort Wayne, Indiana. When you are looking for Fort Wayne dealerships near me for used cars for sale in Fort Wayne, Indiana, come to Lucky 7 Car Store. Lucky 7 Car Store Fort Wayne can be reached by calling 260-424-8866. You can stop in and see us at 2011 N. Clinton Street in Fort Wayne, IN 46805.